Lung cancer is the leading cause of cancer deaths in the United States, among both men and women. Lung cancer claims more lives each year than do colon, prostate, ovarian and breast cancers combined. People who smoke have the greatest risk of lung cancer, though lung cancer can also occur in people who have never smoked. The risk of lung cancer increases with the length of time and number of cigarettes you’ve smoked. If you quit smoking, even after smoking for many years, you can significantly reduce your chances of developing lung cancer. Lung cancer is the uncontrolled growth of abnormal cells that start off in one or both lungs; usually in the cells that line the air passages. The abnormal cells do not develop into healthy lung tissue, they divide rapidly and form tumors. As tumors become larger and more numerous, they undermine the organ’s ability to provide the bloodstream with oxygen. Primary lung cancer originates in the lungs, while secondary lung cancer starts somewhere else in the body, metastasizes, and reaches the lungs. They are considered different types of cancers and are not treated in the same way. There are two main types of lung cancer: small cell lung cancer (SCLC) and non-small cell lung cancer (NSCLC). NSCLC accounts for nearly nine out of every 10 cases and typically grows at a slower rate than SCLC. Small cell lung cancer: It’s also known as “oat-cell” cancer because the cells look like oats under the microscope. It often starts in the bronchi, then quickly grows and spreads to other parts of the body, including the lymph nodes. This type of lung cancer represents fewer than 20 percent of lung cancers and is typically caused by tobacco smoking. Non-small cell lung cancer: Non-small cell lung cancer is the most common type of lung cancer. Most often, it develops slowly and causes few or no symptoms until it is far advanced. SCLC tends to be more aggressive and spread more rapidly than NSCLC. Treatment options vary, depending on which type of lung cancer you have. Tissue sample (biopsy). A sample of abnormal cells may be removed in a procedure called a biopsy. Your doctor can perform a biopsy in a number of ways, including bronchoscopy, in which your doctor examines abnormal areas of your lungs using a lighted tube that’s passed down your throat and into your lungs; mediastinoscopy, in which an incision is made at the base of your neck and surgical tools are inserted behind your breastbone to take tissue samples from lymph nodes; and needle biopsy, in which your doctor uses X-ray or CT images to guide a needle through your chest wall and into the lung tissue to collect suspicious cells. A biopsy sample may also be taken from lymph nodes or other areas where cancer has spread, such as your liver. Careful analysis of your cancer cells in a lab will reveal what type of lung cancer you have. Results of sophisticated testing can tell your doctor the specific characteristics of your cells that can help determine your prognosis and guide your treatment. Once your lung cancer has been diagnosed, your doctor will work to determine the extent (stage) of your cancer. Your cancer’s stage helps you and your doctor decide what treatment is most appropriate. Staging tests may include imaging procedures that allow your doctor to look for evidence that cancer has spread beyond your lungs. These tests include CT, MRI, positron emission tomography (PET) and bone scans. Not every test is appropriate for every person, so talk with your doctor about which procedures are right for you. The stages of lung cancer are indicated by Roman numerals that range from 0 to IV, with the lowest stages indicating cancer that is limited to the lung. By stage IV, the cancer is considered advanced and has spread to other areas of the body. You and your doctor choose a cancer treatment plan based on a number of factors, such as your overall health, the type and stage of your cancer, and your preferences. In some cases, you may choose not to undergo treatment. For instance, you may feel that the side effects of treatment will outweigh the potential benefits. When that’s the case, your doctor may suggest comfort care to treat only the symptoms the cancer is causing, such as pain or shortness of breath. If you undergo surgery, your surgeon may also remove lymph nodes from your chest in order to check them for signs of cancer. Surgery may be an option if your cancer is confined to the lungs. If you have a larger lung cancer, your doctor may recommend chemotherapy or radiation therapy before surgery in order to shrink the cancer. If there’s a risk that cancer cells were left behind after surgery or that your cancer may recur, your doctor may recommend chemotherapy or radiation therapy after surgery. Radiosurgery: Stereotactic body radiotherapy, also known as radiosurgery, is an intense radiation treatment that aims many beams of radiation from many angles at the cancer. Stereotactic body radiotherapy treatment is typically completed in one or a few treatments. Radiosurgery may be an option for people with small lung cancers who can’t undergo surgery. It may also be used to treat lung cancer that spreads to other parts of the body, including the brain. Radiotherapy: This treatment uses high-powered energy from sources such as X-rays and protons to destroy cancer cells and shrink tumors. Doctors carefully direct the energy to the liver, while sparing the surrounding healthy tissue. During external beam radiation therapy treatment, you lie on a table and a machine directs the energy beams at a precise point on your body. A specialized type of radiation therapy, called stereotactic radiosurgery, involves focusing many beams of radiation simultaneously at one point in your body. Chemotherapy: Chemotherapy uses drugs to kill cancer cells. One or more chemotherapy drugs may be given through a vein in your arm (intravenously) or taken orally. A combination of drugs usually is given in a series of treatments over a period of weeks or months, with breaks in between so that you can recover. Chemotherapy is often used after surgery to kill any cancer cells that may remain. It can be used alone or combined with radiation therapy. Chemotherapy may also be used before surgery to shrink cancers and make them easier to remove. In people with advanced lung cancer, chemotherapy can be used to relieve pain and other symptoms. Immunotherapy: Immunotherapy uses your immune system to fight cancer. Your body’s disease-fighting immune system may not attack your cancer because the cancer cells produce proteins that blind the immune system cells. Immunotherapy works by interfering with that process. 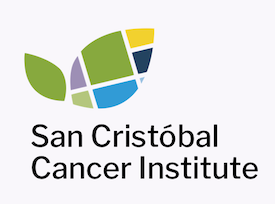 If you’d like to learn more about Lung Cancer through our San Cristóbal Education Resources, attend our events or learn about our Cancer Center, please contact us.